CDE harnesses the power of racial and ethnic diversity to transform the U.S. environmental movement by developing leaders, catalyzing change within institutions and building alliances. Since 2008, we have directly served over 3,000 people & 300 organizations, but we know that our reach goes far beyond the metrics. The challenges, opportunities, and solutions at the root of the diversity, equity, and inclusion issues that have plagued the environmental movement are built on many layers of complexity. Discovering and addressing these root causes takes courage. In order to effectively facilitate the depth and breath of this kind of change work requires graceful facilitation. To do this well, facilitators must bring a sophisticated understanding of power and privilege, must understand how to assess equity in outcomes, and must skillfully create safe spaces and build trust in order to support an opening to vulnerability and courage so that participants can dig deep into learning and engage their hearts in the process of radical change. A successful process opens up new avenues for deep understanding, inspires participants, and ignites change in both heart and head. 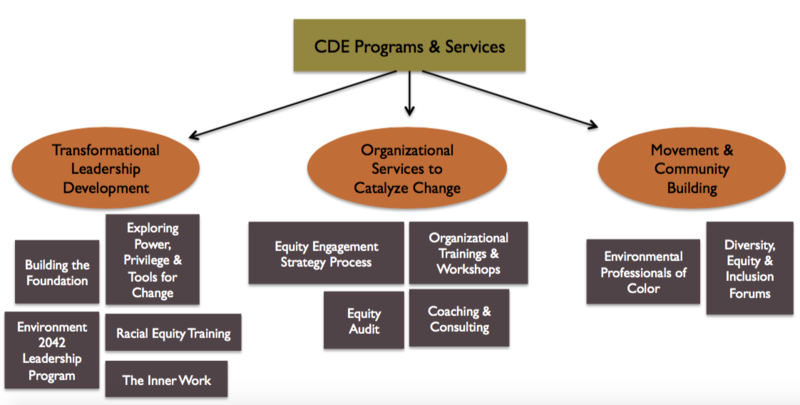 CDE’s programs engender change at the individual level, the organizational level, and movement-wide. This is our three-pronged approach to breaking down cultural, systemic and institutional race issues. Individual: Our transformational leadership opportunities speak to individuals who wish to become effective change agents in their communities. The success of the revolution in the environmental movement will be carried day to day by these innovators and thought leaders. Organizational: At the next level, we support organizations along the length of the change continuum, from the establishment of a solid foundation upon which to build future success, to customized programs that support ongoing navigation of this nuanced work. Our programs include retreats, trainings, and coaching & consulting services that ensure ongoing institutional evolution. Movement & Community: Ultimately, the success of this movement will depend on our ability to work together across difference, to build relationships, and to engage with our communities. We coordinate a national coalition of people of color who support one another in their efforts to bridge the historical divide between the environmental community and communities of color. We also convene community engagement forums to involve members of the environmental community and communities of color in collaborative development of action-oriented solutions.